Hi all!- I just wanted to stop in and say Happy New Year to you all!! I will be making and posting new cards, and projects soon. May the new year bring all of you nothing but peace, love and joy!! Thanks to you all that have made my blog a success so far in just the two months I have had it!! It means a lot to me!! I am looking forward to growing, and sharing new things, and thoughts in the New Year. God Bless!! Good Sunday evening to you all!- I hope this post finds that all of you had a wonderful Christmas with your families and your friends! My time with my family was great. Of course, there was really good food, sweet treats, and presents. I received a few nice things. I am blessed with what ever is given to me, and my husband. It is back to starting another work week, and then we head into a New Year- 2011! WOW- so hard to believe that this year is gone, but we are moving on to new times, new opportunities, and possibilities to share. I pray that those that do not have jobs, are able to find them. It is super tough in this economy, and even though I have frustrations with my job, I am most certainly happy to have it, and able to meet my obligations. Since it is the day after Christmas- all the sales were on today. My main goal today was to get gift bags, tissue paper, wrapping paper, you name it, so I could be stocked for next year!! I did pretty well in that dept. The crowds weren't too bad. My hubby put up some more Bygel Rails from IKEA in my craft room. I have more space to store more punches. I now have a total of six rails up above my desk. I will update my pictures of my craft area soon, AND when my camcorder comes in, I will put up a video on You Tube to show you my space as well, so be looking for that. Well- those are my updates for now. I would like to share a card with you all. I had made this card back in October for a friend's birthday. She, like myself, loves butterflies. I stamped the butterfly, and then used my blender pens to color in the butterfly to give it a soft look. I just made a "pool" of various colors from some of my Stampin' Up ink pads. I love the "foil" effect that the roses give on the back ground paper that I used to adhere to my card base. It is getting late here, so I need to wrap up tonight's post, before heading off bed. Be good to one another!! Hi all! - I am posting this kinda late tonight. I wanted to take the chance and wish everyone a very Merry Christmas! I will be with my family the next few days, so I won't have the chance to post anything. May this Christmas bring all of you love, happiness and joy!! I think of how grateful I am to have my family-that they are safe and count each blessing that is given to us. I pray for the soldiers and their families during this time, and of course always, b/c without them, we wouldn't have our freedom! I pray that the winter weather that is calling for this area doesn't get too bad where all the people that are traveling, like myself can get to their friends and family safely!! I will leave you with another card!! I wish you all peace and joy!! I was able to use some of the Stampin' Up DSP ( designer series paper) that I recently purchased on this card. My husband said in the middle of the die cut piece that it looked like snowflakes. I really liked the layered look about this card. It turned out nice. Well- in the future, for those of you that like You Tube- I will soon be doing some tutorials. I won't lie! I am nervous about it all. I honestly do not like the way I sound on recorded video, or phone msgs. Anything that I can hear my voice on playback, I just say EEEKKK... :o( It is funny, you always sound different to yourself in your head...teehee. Well- nonetheless, be on the look out for videos in the future. I am waiting on my camcorder to be quite frank. My husband actually bought me one for Christmas, and we both didn't like it. It seemed cheaply made, and found something else. We are getting a Creative Vado HD pocket camcorder. This thing has several good and high reviews, so it should be worth the money ( which isn't bad by the way) and the wait!! Well- I am going to call it a night. Stay safe out there for those of you that have been procrastinating on buying Christmas gifts... ( that would be me- but nothing major to get). Night my friends! Hi all on this Sunday afternoon- I just wanted to pop in for a quick Sunday share of the new projects I created. I have seen these on the web, and thought they were so cute, and a great idea, and I wanted to try my hand at making some. These are Post-It note holders. I made two different sizes- some for the 3 x 3 size, and some for the 4 x 4 size. I just bought the acrylic photo holders at Wal-Mart, and just added some patterned paper instead of a photo, and added my Post- It notes to the bottom with some adhesive. Then I just added some embellishments. This is my first hand at making these, and I will be making more in the future. They are "easy- peezy" to make, and fun. I am probably going to add some of these to my Etsy Shop as well to give more variety of what I have to offer. Anywho- here they are! Like I said- this is a short hello- but I just wanted to share these with you all!! More tomorrow! Good Sat. Morning to you all.- I was thinking last night that I would love to know how many of you really read/follow my blog. This is a way to make yourselves known to me, your author. How many of you enjoy seeing the cards I post, and the things I share. I would like to get a con census of where you are in the world, SO- with that in mind, down in the comment section of this post or there is a comment box on the right hand side bar of my blog ( you can scroll down toward the middle of the blog), please leave me a comment of where you are in the world, if you are a crafter of sorts, or if you are just a follower of reading blogs or both!. You can leave me just your first names, or names can be private- this is up to you. I can see on a daily basis, the numbers of my audience, and a map of where you are, but I would like to hear from you individually! I think this would be fun, and introduce yourselves to me, and others. Consider this a Christmas present that you are giving to me- and the best part, it is FREE!! OK everyone- let's get commenting!! I can't wait to see how many of you are out there!! Happy Happy Friday to you all!- I can't express to you how happy I am that it is Friday! I want to be able to get a card made or two this evening, so this will be a short and sweet post tonight. I just basically want to share with you another Christmas Card, since we are after all one week out from celebrating Christmas. In two week we will be saying bye bye 2010, hello 2011!! That is just craziness!! Time is flying by super duper fast!! So- here is Friday's card share- hope you like it! The Christmas tree was cut out from a piece of 12 x 12 paper from DCWV from their "Homemade Christmas" stack. I just added some glitter on around the bottom of the tree to symbolize snow glistening. I leave you with a YouTube video from a Charlie Brown Christmas! Hi all! For some reason, my thoughts are not flowing like I think they should, but maybe that is because my brain is tired from all the craziness happening right now. Work, well- is work, and that is another TV show, and time, then there is thinking about what I need to do to get ready for Christmas that is NEXT WEEKEND! I am happy and also not ready. It seems the older I get, the more I procrastinate when it comes to Christmas. I guess it is because it seems everything happens all at once, and I am talking about parties, buying gifts, paying bills, and even the ones that shouldn't be no where near this time of year ( property taxes are due where I live) because it is near impossible to pay before the deadline. Besides all that, just finding the time to unwind is hard. That is why I am looking forward to a 3 day work week next week, and then off for 4 days!! Thank you Lord!! So- with this happiness in mind, how about a card share! That is why you are reading this right??!! This card was made especially with a family member of mine in mind. The snow scene you see there, I just colored on the stamp to get all the different colors. I love this scene. Even though I do not like winter, this is the way it should be, all fun, and special memories. Just a friendly reminder, that my Etsy "shop" is now open, and you can go directly to what I have for sale right now by clicking here. I bid you all a good evening or a good day where ever you are reading this in the world at this moment. Stay safe, and be kind to one another! Boy oh boy it has been a week. What is it lately, and times being so rough. I don't get it, but maybe I am not suppose to understand. These rough times makes me appreciate my hobby that much more, and being able to share my cards and creations with all of you. I am blessed that I have had so many people interested. In a little over a month that I have had this blog, I have had over 800 hits, 3 followers( which I would love more), and an audience that expands throughout the U.S and even outside the U.S.A. Thank you all for your support by simply coming and seeing what I am sharing day to day! Now this is a blog about cards, so let us get to today's card. I had made this card for my mother on her birthday this year, as she LOVES her hummingbirds. I took my hummingbird stamp, and colored it all over with Stampin' Up markers. I also took a glitter pen and added some dimension to the eye of the bird. 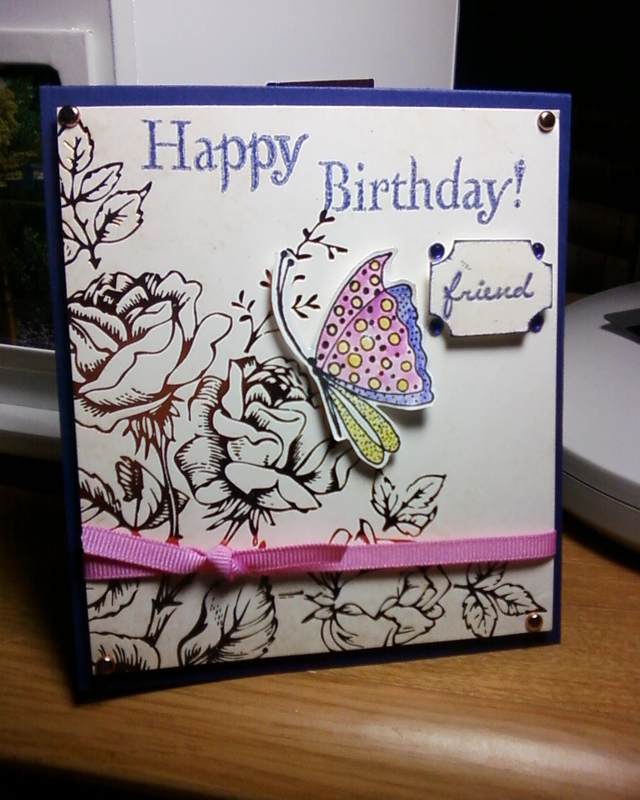 I took some scrap card stock of the same color as my card base, and embossed it with an embossing folder by Sizzix. I apologize but can not remember which pack it came out of. I then added some fuchsia card stock behind that embossed flower image to create a frame. I popped the hummer using pop dots or dimensional stickers as some prefer to say, and added some embellishments. My mom loved it. Any questions on any of the supplies used on this card, please just comment or email, and I will gladly respond back. Again, thank you all for your support and visiting KWCardDesign. It will only get better from here!! Hi Friends- This is what I have been working on for the last few weeks. Of course I had to stop and start, because I had other things going on, and I do have a day job, I only get to craft at night. So after a request to make some cupcake toppers for a coworker/friends daughter that will be turning 2, I made these for her. They turned out well. Chelsea was pretty pleased with them. I think she especially liked the ones with the owls. :) Well, I need to head off to work for the day, but wanted to share these with you. Have a blessed day everyone! Hi all! I'm back with a new post on this Sunday. I had a few days away since I celebrated my birthday, and trying to do some Christmas shopping. It has been chilly here in Missouri the last few days. I've been busy with several different things. My hubby and I went first and rented a ride for the trip to Springfield, MO, so my parents could be with us. We all could not fit in my little car, so I have been spoiled by the ride we rented for the weekend. A 2011 Jeep Grand Cherokee. I am so in love with this vehicle, it is not even funny. I, then went to a Stampin' Up gathering like we do every month, and that was on Friday ( the 3rd). Then, Saturday morning was the local craft and art show, which was fun. I went by my lonesome, which is fine. I actually went both days that it took place, Sat and Sun. We all got in the beautiful Jeep on Sat, and went to Springfield, where we ate at my favorite place, Cheddar's. If any of you like Cheddar's, then you know what I am referring to on how great it is. We did a little shopping, and then came home. Then, here we are, Sunday, and I got out a little bit this morning, of course like I said, went back to the craft show, and got a few more things, and get this......even got a caricature done of myself! It so neat!! I have always wanted one of these done!! So- It has been a pretty busy weekend. I wanted to get a post in, since I hadn't in a few days. Here is today's card everyone. We actually did this on Friday night at Stampin' Up! The stamp set that was used is "Serene Snowflakes" by Stampin' Up! There are other uses for your dryer sheets than just your laundry :o) With a little bit a creativity, you can use just about anything it seems. Thank you to Margaret Gobel, my Stampin' Up demonstrator for showing us this technique. Stay safe my friends! Till next time! Hola everyone! - Hope that all had a nice Thanksgiving for those of you in the U.S. I filled up on the best part, the dressing and dessert! It was back to work after 4 days of leisure, and let me tell you, I was happy to have it. I knew I would have to go back to the hustle and bustle at work, so I enjoyed as much as I could not having to think about work and what all goes on there. OK- how about a card? I have been trying to decide on what I wanted to do to add more storage in my craft room/aka "happy place", and then it dawned on me that I have a shelf in our bedroom that really isn't getting that much usage properly, SO, with some discussion about it, we came up with a plan and now I have that shelf hanging up in my room, along with some BYGEL rails from IKEA. So- I organized, cleaned and cleaned some more, and I purchased a little computer desk and now I will have a spot solely for my laptop and printer, and my other desk strictly for my paper crafts. For my birthday which is coming up on Friday (12/3), my husband actually looked at my list that I had made and bought me a label maker that I had wanted. I was a labeling fool on Sat. I have new photos up now of both my cards and my craft room as it is now. You can go to my "photos" tab on my main page to view them. Well- that is it for now- will post again tomorrow! Hi Friends and Happy Thanksgiving to you all- My husband and I went down to my parents house today to partake in some wonderful food. Of course, as always the dressing is always my favorite. I could make a meal just out of the dressing, I tell ya. We traveled in yucky rainy weather to get this wonderful meal today, but I am just thankful that we made it safe, and that we had a meal to enjoy with my mom and dad. Now we are back home, and settling in for the night. Here is today's card that I am sharing with all of you. What I enjoy the most about this card the beautiful focal point of the maple leaf, and this stamp is from Hero Arts. I took some browns, yellows, greens and reds and used these ink colors with my blender pen to make this leaf come together. I think it turned out well. Being home from work...currently that is what my happiness is. I won't bore you all with the details, but hectic doesn't even come close to describe today! Days like this, I just want to lie in bed, and sleep or watch TV and think of nothing! **Breathe** Let us move on to happier things..like today's card! I have a new way of photographing my cards, and so most of the ones I have taken pictures of are just on my desk. Anyway, today's card is such a fun card. It has bright happy colors, and who doesn't like bright and happy. I honestly made this for a particular friend at work, and it fits her personality to a "T". I thought I would just let the card speak for its self on this post, instead of my going into my usual detail of how I put it together. If anyone that reads my blog, makes cards, and are interested in any of the things you see, like where the cute bus stamp came from, and what not, I will be happy to share this information with you. When I made this card, I wished I would have been into coloring with Copic Markers then, but did not have any at the time, and didn't know as much information about them as I do now. We are getting closer day by day, inch by inch of gathering with family and friends and stuffing ourselves till we pop! I smell the wonderful fragrant of my grandmother's recipe for dressing or some of you call it stuffing. I am more than ready! Till tomorrow! Have I got your attention with today's title?! Yep, thought so. You didn't think you could make Rudolph from an owl did ya? Well, as you can see Rudolph has many forms...LOL. Well, this is how it is done. There is an adorable Owl punch from Stampin' Up! that I used.You can look here to get the idea of what this punch looks like for those who do not know. I just took the main body of the owl and trimmed off the little feet. I used all the parts that would be for the eyes, and then I remembered I had some "wiggle" eyes, and thought that would be a fun little addition to Rudolph. I have a tree punch that looks like it has lost its leaves, and punched one of those out in black, and used some of the branches, and used them for his antlers. For the background, I took the Top Note die from Stampin' Up, and sponged the edges with Walnut Stain Distress Ink. I used the background stamp from Stampabilities called "Swirls & Curls" and inked the stamp with Broken China Distress Ink and then stamped that onto the Top Note die I cut out in light blue card stock. I added my "Merry Christmas greeting" and added some ribbon to the bottom. Hope Monday was kind to all of you! We are gearing up for Thanksgiving aren't we. It is suppose to be COLD here, and I am not looking forward to it. I thought I would add that sentiment. 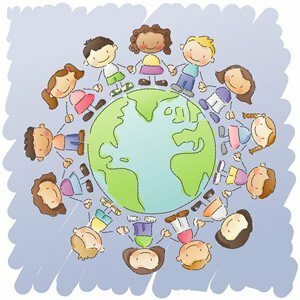 OK, friends, be good to one another! I am glad that this day is Friday! Even though I only have one day off, which is Sat, it is OK, because that will mean I will have a 4 day weekend for the Thanksgiving holiday. Let's get to today's card! For today's card, I used some red card stock from Stampin Up!, and I used a stamp from Hero Arts that is a distress frame. I actually inked it up with versa mark ink, and the spread some white embossing powder and heat set it with my heat tool. I wanted the emboss resist look, so that is why I started out with my frame first, so when I used some of my Fired Brick Distress Ink all over the card front, the embossed image would resist the ink. I just rubbed off some of the excess, and it shows that beautiful distressed frame. I, then added in the middle of that frame a "snow globe" sticker from K&C Company from their Yuletide collection. I added some Christmas ribbon that I purchased from Oriental Trading, at the bottom, and another sticker from Making Memories from their Mistletoe collection. It is the beautiful snow flake sticker you see there. I, then added some "stiching" with my white gel pen to make it pop. Pretty simple card. Hope everyone has a great Friday, and weekend! Stay safe out there! Today's card is featuring a new technique I learned just evening. It is called the "reflection" technique and I absolutely LOVE it! The best part, is that it is so easy! My first try at this turned out awesome, and I couldn't be more happy about it. My card base is again some card stock from Stampin' Up!. I used the "Lovely as a Tree" stamp set. I inked up my stamp with some Memento black tuxedo ink, and stamped it onto white card stock. I think repeated the same step, but instead of stamping the image on the card stock, I stamped it on a piece of transparency, or clear acetate. I took that piece of transparency, and turned my image upside down and lined it up with my first stamped image. I took my brayer and roll over the transparency to transfer the image onto the white card stock, and "vwa-la" the image looks like it has a reflection. I took some of the blues I have of my Distress Ink, Tumbled Glass, Broken China, and Faded Jeans, and made the image of water. I, then took with my ink blending tool from Ranger, and some more of the Broken China ink and blended the edges as well. You can't see it, but there is some glitter along the bottom of the trees where the ground is. It looks like "snow" and I also added the same glitter onto some of the trees. The glitter I used is "Dazzling Diamonds" from Stampin' Up!. I matted the whole image onto black card stock and then added the ribbon, and a label with the stamped image "seasons' greetings", and placed all that onto my card base. It turned out beautiful! I will wind up making more of these. I showed my hubby and he LOVED it! Any questions or comments, I would love to hear from you. Till tomorrow! Be good to one another! WHEW..what a day it has been. I am so thankful I have my card making to fall back on as a stress reliever! I tell ya, some days leave you scratching your head and asking "Really"??!! Let's get to today's card. I am pretty proud of this one. Not that I am not proud of all my cards, but as a card maker there are ones that you are just so happy how they turned out, sometimes you want to keep them for yourself. I took some patterned papers from the Amber Autumn matstack from DCVW, and placed one all over the card front, and the other I used my Fiskars edge punch "Treading Water", and put that at the bottom of the card. I sponged at the bottom of the edges some Vintage Photo Distress Ink to make the pattern paper appear a little softer. Then, I have some "Woolies" stickers from Basic Gray, and applied that beautiful sticker onto the card front as the "center piece" of the card. Your eyes just goes right to that beautiful thing, and the colors are perfect fall colors. I took some scrap orange cardstock I had and stamped my "thanks" greeting from a stamp set from TPC Studio in Fired Brick Distress Ink, and also sponged the edges with that same color as well to tie it all together. I made this card Tues night. 11-16-10, and gave it to a friend/co worker today at work. She loved it! I take pride in my cards, and giving to those that appreciate them. Makes this girl feel good inside. Hope your day was a good one. Till next time, be good to one another. How is everyone's Tuesday going? I hope well. Another work day finished. Thank you Lord! Today's card is a Christmas Card. I actually made this one last year during at a Stampin' Up party. The cards' base is vanilla cardstock from Stampin' Up, and it has an embossed flourish in the middle of the card with gold embossing powder. I also embossed the stars and placed them randomly onto the card around the flourish. Then I took my " Merry Christmas " greeting and stamped at the bottom right hand corner. Very simply, not too fussy. It really didn't need to be, because of the beautiful gold embossed flourish and stars. Today's post is short but sweet and to the point. Any comments or questions, I would love to hear them! Thank you friends. It is Monday, and I am happy that I am posting this after I have finished my work day! I have to admit that today flew by, which is really good! Hope that your weekend was filled with lots of smiles, and relaxation. I spent some quality time with my hubby and a friend of ours in Springfield! We always seem to have a good time! Today's card is focused on the different embellishments I used for flowers. I thought it would be fun to use paper flowers, buttons and gem stones, and make them into their own different flowers. Of course, I started with my base, which is Concord Crush cardstock from Stampin' Up!. Then, I took some pattern paper from a paper pad I bought at Big Lots and used my punch from Martha Stewart. I just used the corner punch for this, but there is an additional punch that allows to you punch all around the page with the same pattern. I, then took a label die cut that I had and sponged the edges with wild honey Distress Ink to give the edges some color and pop. I stamped onto my label die cut my flower stems from my Stampin' Up! stamp set "For Everything", and then added the gemstone, paper flower and button for the flower tops. Last, I just added an "hello" greeting. Hope this card inspires those to use different embellishments in different ways. Until next time! Be good to one another! Today, I am sharing with all of you a very colorful card. It is "tie dyed" if you will. It was fun just grabbing random colors, and just rubbing on to a sponge these colors and then transferring them onto my cardstock. I made this for a specific friend of mine that accomplished a big thing in her life, and I wanted to make it special so she could look back and remember that happy day, as it is titled The stamped sentiment is embossed and I punched the bottom with the scallop punch from Stampin' Up!. I then matted it onto green cardstock and then matted that onto my base. I added a green paper flower with a rinestone middle, and placed another clear epoxy sticker from Cloud9 on the bottom. I then just added a few jewels onto the sentiment. This weekend I will be spending quality time with my hubby. I always love those times together with him, and this weekend will be two in a row! Hope all of you have a nice weekend! Stay safe my friends. By the way before I go, I wanted to send a Happy Birthday to my friend and classmate Heath Stocks. I hope this birthday reminds you how special you are, and that lots of people love and care about you!! Bye for now. This day we celebrate our veteran's as they have made the ultimate sacrifice. Without them, we wouldn't have the freedom that we do. God bless them all! Today's card features the beautiful bald eagle, another symbol of our freedom. I actually had made this particular card for my father - in- law for his birthday. I have a clear stamp set from Mint Motif that has the polka dot design, and I stamp all over my cardstock with versamark ink. I then spread red embossing powder all over and heat embossed it, and after it cooled, I took my crimping tool, and crimped it to have a wavy texture to it. It is kinda hard to see in the photo, but just me, it is there. I placed my stamped image of the eagle on real red cardstock, and used the ticket punch on the ends. I then took my choc. chip ink and gave the ends a distressed look. I finished it off with my birthday greeting, and delivered it with a smile. If you know someone that has served for our country, please tell them thank you, and that you appreciate their time served. Everyone has a blessed and happy day. Happy Middle of the week! We are surely making our way to Friday, which I am happy about. This morning's card is in your face with a Happy Birthday. I printed this cute image from a site called "coloring castle" I believe. I colored entire thing in Copic Markers. I love Copics. I am in the early stages of getting these markers, but the ones I do have, I just love. I love all the dimension that it gives, especially if you color it right. This inspired me to color like a favorite Copic teacher, which I wish I could meet and take classes from and that is Suzanne Dean. This woman is awesome! Check out her blog, and see some of her wonderful artistry. Tell her I sent ya! I just added some pearls, some paper flowers, and used my Fiskars "treading water" border punch to bring more yellows to this card to bring it all together. Just so everyone knows, and if you are interested, I will be setting up an Etsy account in the future for purchasing cards if someone is interested, till then you may email me, or comment below if you want something specific. Thank you! Hope your day is blessed. Hi Friends! Thought I would post something this morning, instead of in the afternoon. I worked, it seemed like hours last night trying to improve my new site here, and s-l-o-w-l-y but surely I am improving it day by day. There are still lots for me to learn! My card for today is very simple, but it gets the message across. It reminds me of my sweet mother, because she loves hummingbirds. I took some textured gray card stock as my base. I then stamped that beautiful hummingbird and embossed it. I, then embossed with white embossing powder one of the flowers from the Fifth Ave. Floral stamp set from Stampin' Up! and then, with a spray bottle spritzed my flower with water. It makes some pools onto the flower, and then I took two different colors of re-inker, and just lightly touched with a paintbrush ( or you could use an aqua painter if you have one) some of the reinker to the pools of water and let it spread through out the flower. It looks like a "hot mess" at first, but once you let it dry, the wait and the effect is beautiful. I cut my flower out, and popped it up on some dimensionals. I, then stamped my "thinking of you" greeting, and also embossed that as well. This card is one of my favorites. That is probably why I still have it and have kept it to enjoy for myself! :o) Thanks for stopping by friends! How is everyone dealing with the time change? Me? I can deal with an extra hour of sleep! :o) Hope you all had a nice fulfilling weekend, and spent it with someone you care about, or just some alone time isn't all that bad either. Today's post, I have this card I made featuring a Stampin' Up! set called "Trendy Trees". I just love this stamp set. You could do so many things with it. I stamped the trees using the stamp-a-ma-jig, so I could align the trees up perfectly. I used pumpkin pie, old olive, and taken with teal dye inks. I used some pattern papers from DCWV, and used the scallop border punch. I added three eyelets to bring it all together. It is a pretty simple looking card, but you know the person that received it the card, it brought a smile to their face, as that is my goal, Any comments or questions, they are always welcomed. I am still new at all this, so if anyone is reading my posts/blogs, I hope you are enjoying them, and if you have any input, I welcome that as well.